ONE I spotted this bright blue pony skin shopper in the Ted Baker store in Dublin and feel seriously tempted – the euro price escapes me but it’s listed as £169 online. It also comes in leopard print and tan. TWO Gold and blue – or more specifically, turquoise – was the main theme throughout Anna Dello Russo’s amazingly extravagant collection for H&M. I wrote about this here and here – did you snag anything from the line? THREE Loving the zip detailing on these skinnies from Paige Denim. They’re £245 online here but you'll also find Paige in Ireland in BT2, Dundrum Town Centre - y'know, should you suddenly find yourself in possession of a small fortune and a spare afternoon. In which case, call me? FOUR Sally Hansen teamed up with designers Prabal Gurung and Alexander Wang to create some stunning nail polish shades to complement their AW12 collections. This dusky blue shade, Blue Rose, was worn on the runway for the Prabal Gurung show during New York Fashion Week. Look out for it in your local pharmacy, but be quick - it’s a limited edition. This is €8.95. FIVE This Peace floral print scarf from Me and Kashmiere looks soft, cosy and feminine. Print is also huge for AW12 so it’s ticking two trend boxes right there. Plus, this is made from 100% cashmere – what’s not to like? It’s £95 from Trilogy. SIX I love the chic simplicity of this Marc by Marc Jacobs watch, with its gold detailing and navy leather strap. Let’s just overlook the fact that I’m pretty rubbish at telling the time. Did I just say that out loud?! I spotted this on ASOS where it's €232.90. Are you feeling blue this autumn? Oh, and psst! If you're in need of a treat do stop back to the site this afternoon, for the latest birthday giveaway here on Fluff and Fripperies. I adore cobalt & turquoise, love your picks! I really like bits of blue to brighten a winter outfit up. Great picks Emma. I like the trousers and the scarf. Great colour, always chic. 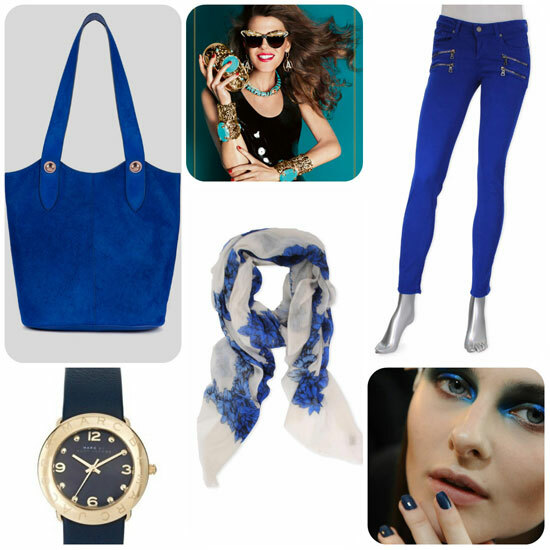 I have really warmed up to this electric blue shade, looks great in those jeans and lurv the scarf! Blue is a colour I always think won't look nice on me but when I try anything on in a cobalt blue or duck egg blue I love it. I do love blue nails and that scarf is gorgeous, I'm a sucker for a nice floral print scarf! Cobalt is really one of my favorite things right now. I really adore those pants and that scarf.